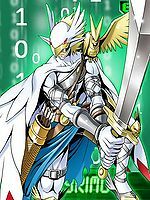 A Warrior Digimon of Norse mythology. 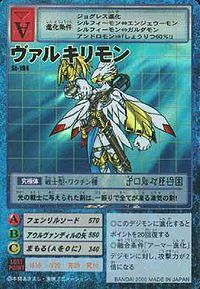 It is accompanied by the golden bird "Freyja", which informs it if danger approaches. 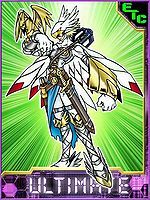 Also, it is said that it produces an aurora from the shining armor it wears, which resurrects the data of heroes that have fallen in battle, and returns them to a new DigiTama. It is the possessor of such speed that it shows up like a gale, then slashes at the opponent with a swiftness too quick to catch with the eyes. 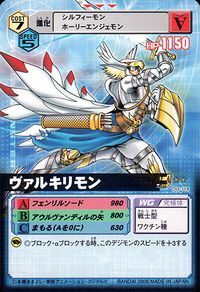 Its Special Moves are a cursed, absolute zero sword that slashes at and freezes the opponent, bringing their vital functions to a halt (Fenrir Sword), and an unerring arrow (Aurvandil no Ya). 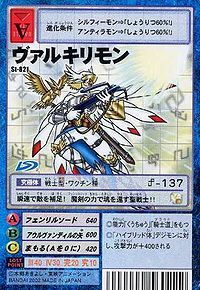 Valkyrimon was adopted from a winning Digimon entry in the "Digimon Web Dot-art Contest" which belonged to Mr. Naohisa Tamura from Chiba prefecture. | Valkyri comes from Valkyrie 「ヴァルキリー Varukirī」 who were women who took the souls of the dead to Valhalla. 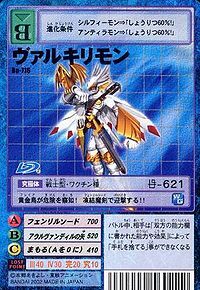 フェンリルソード Fenriru Sōdo Feral Sword/Fenrir Sword It uses its absolute zero demonic sword to freeze the opponent when slashing at it, completely ending their life activity. Aurvandil no Ya  Aurvandil's Arrow アウルヴァンディルの矢 Auruvandiru no Ya Lightning Arrow Fires arrows that always hit their targets. Summons a javelin and launches an explosion from its tips. サンクションストーム Sankushon Sutōmu Punishing Storm Raises a tornado to chastise its foes. 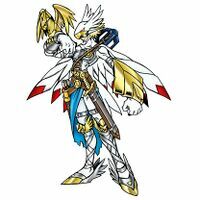 Valkyrimon is the Partner Digimon of Inoue Miyako and the Ultimate form of Hawkmon. 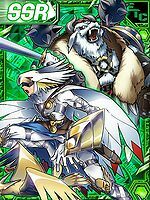 Evolves from Silphymon at level 41. 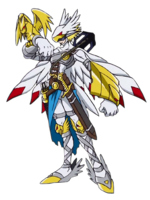 Valkyrimon became an obtainable Digimon after an update to the game. 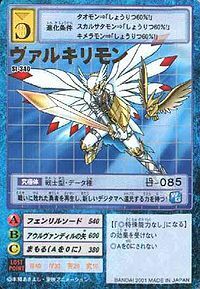 It evolves from Angewomon, Silphymon, and Holy Angemon at level 50 with 130 ATK, 130 INT, 160 SPD, and 20 ABI. 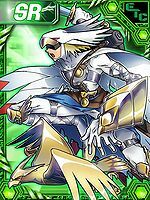 Even before the update, Valkyrimon was available as a Digimon Medal. 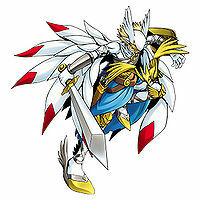 Evolves from Silphymon Jogressed with a Garudamon and is one of the playable Partner Digimon. 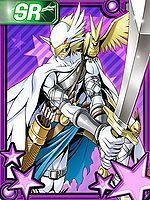 The sword given to this warrior of light is a freezing sword that turns everything to ice with one swipe! It has the power to revive heroes who died in battle and return them to DigiEggs! It captures the enemy with blinding speed! This holy warrior sends off souls with the power of its Fenrir Sword!! It sends Freyja to scout the area for threats, and counterattacks with its Fenrir Sword!! 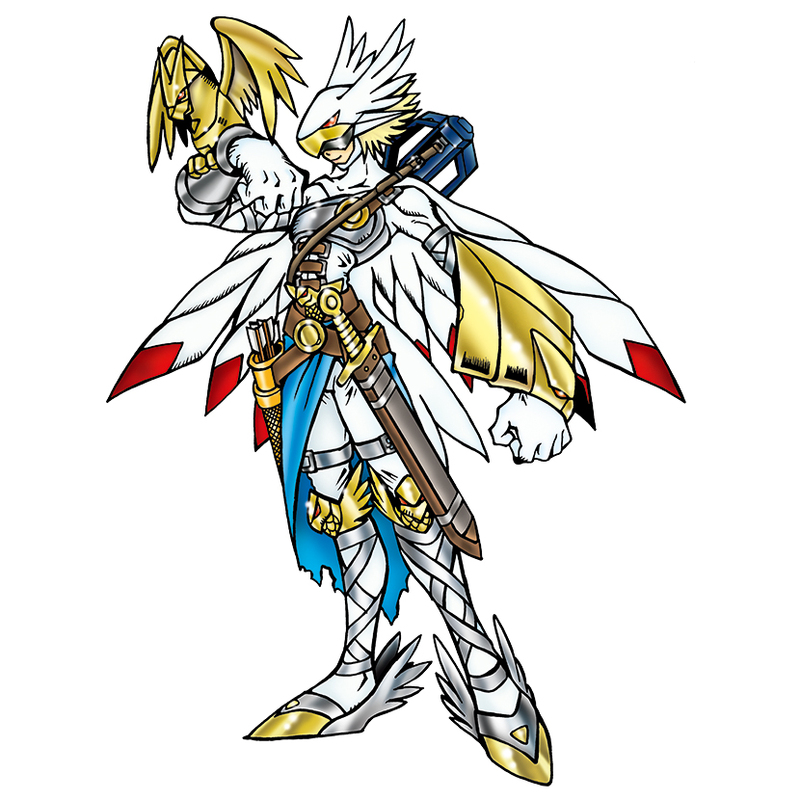 ↑ Valkyrimon was adopted from a winning Digimon entry in the Second Original Digimon Contest (Digimon Web). This page was last modified on 5 April 2019, at 16:39.